Home Documentation Can I delete an experiment ? Whilst you cannot delete an experiment, you can archive it. Once an experiment is archived you can still access the results page, however you will not be able to relaunch it. NB: You can archive an experiment that hasn’t been launched. You can also archive projects. 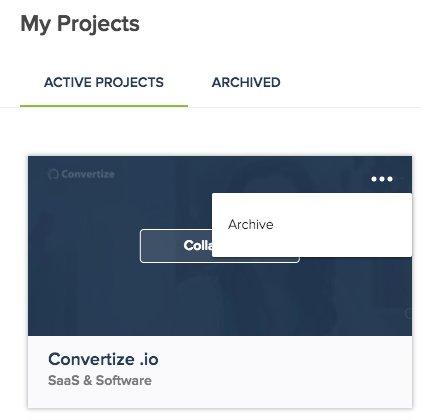 In the My Projects tab, click the top right of a project and select ‘Archive’ to do this. Please note that all experiments in the project must be disabled first. Once again, please be aware that once you have archived your experiments, they will become “unarchivable” meaning that they will not be usable anymore – essentially deleting them. The key difference is that you will have access to the results forever, even after archiving the experiments.